and tickets, go to centralcoastcraftbeerfest.com. At what point does a home brewer become "the real deal?" When does a hobbyist tinkering around in his or her garage turn into a true "brew master?" For a growing swath of small, independent brewing companies popping up across SLO County, it's about more than just going through the legal red tape or offering a spiffy logo glass. It's about fulfilling a lifelong dream. It's about being able to finally share a singular beer vision with the world. Today, I chat with a few of these proud and resourceful micro brewers, all of whom are bringing select suds to the Central Coast Craft Beer Fest overflowing Saturday, March 24, in Atascadero's Sunken Gardens. IT'S ALIVE The new Dead Oak Brewing Co. is located near Atascadero's Sunken Gardens, where more than 40 breweries will converge during the March 24 Central Coast Craft Beer Fest. Yes, it's the official kickoff of Central Coast Beer Week, which runs through April 1 and promises to fill us all up on every kind of brew imaginable. Still not sure what the whole craft beer boom—and the subsequent aftershock—is truly all about? Think a beer is a beer and nothing more? Consider this quote by Canadian essayist and professor Hugh Hood: "Nothing ever tasted better than a cold beer on a beautiful afternoon with nothing to look forward to than more of the same." Few things in this ever-changing modern world are this simple and this accessible. Art. Food. Beer. Does a human really need more than this? I say, toss out those rose colored glasses for a pair of craft beer goggles. You never know what new wonder you'll discover. Who knows. Maybe you're the next great microbrewer on the block. Sometimes you just need to throw caution to the wind and go all in for that desire that makes your heart do a little dance. This is the story of Dead Oak Brewing. The new brewery and taproom opened about five months ago in the historic colony district of Atascadero, not far from the site of the upcoming Central Coast Craft Beer Fest. The space—which also houses brewing tanks and communal tables—was once the old Pet Department. Owner Jesse Kaltenberg is originally from Phoenix and his wife and co-owner, Nikki, hails from Bakersfield. Jesse said this move to the Central Coast, and their newly opened brewery, represents a huge life 360. Oh, and their entire life savings. "We'd lived in Orange County the past eight years; I was a civil engineer and she was in finance. I took a brewing program, and after that, we sold our house and cashed out our retirement," Jesse said. "I sought out to bring back some good clean examples of more traditional beer styles." A New England style IPA and lager are in the works, but Jesse, forever tinkering, aims to continually rotate fresh offerings. Be aware: You won't find current beer trends (or fruit) in any of these pints. As far as if this risk will pay off, only time can tell. Said Jesse, "We thought about building the brewery in terms of having more freedom and being in control of our own destiny." Dead Oak Brewing is located at 925 Entrada Ave., Atascadero. 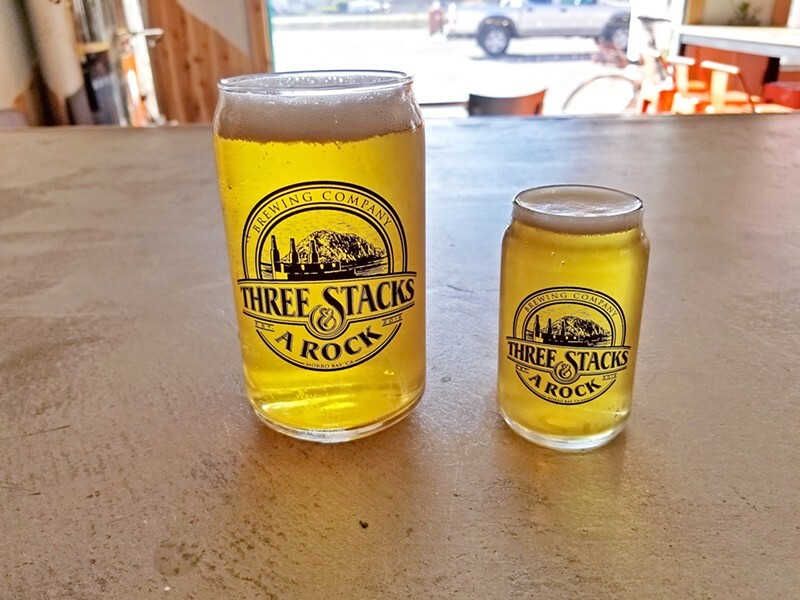 WE WILL ROCK YOU Three Stacks and a Rock Brewing Company in Morro Bay is the beach town's only "nano brewery," offering up super fresh small-batch craft beer in an unlikely strip mall space. Never judge a brewery by its square-footage. Chuck and Ananda Nettnin of Three Stacks and a Rock Brewing Co. in Morro Bay have created a cozy taproom tucked away in an unassuming strip mall. The space is small but their passion for beer is tsunami sized. The couple moved from the craft beer mecca of San Diego to Morro Bay a little over a year ago without any intention of starting a brewery. But then they noticed something was missing. With the exception of Libertine Brewing Co., craft beer didn't have a starring role in Morro Bay's easygoing community. So, they set out to correct that. 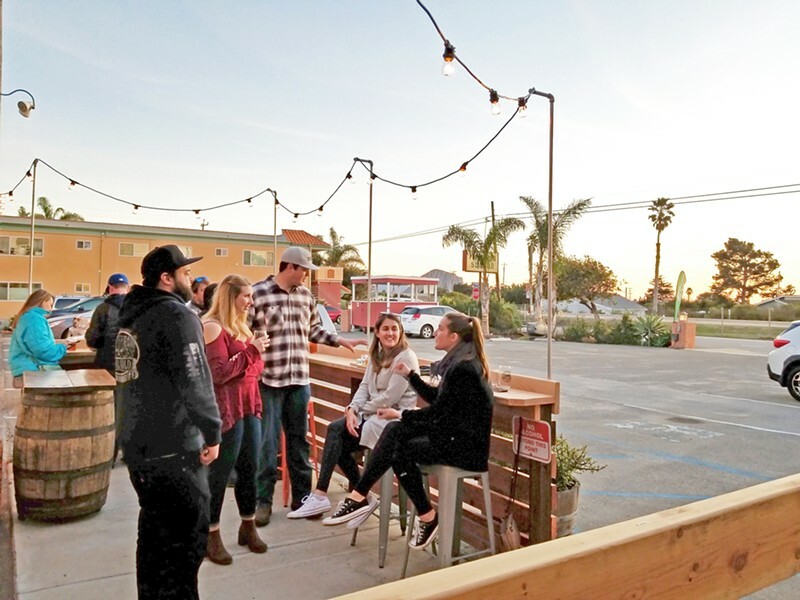 WHERE THERE'S BEER An everyday parking lot is transformed into a chill and laid-back beer garden at Three Stacks and a Rock Brewing Company, one of a slew of brand new breweries pouring at the Central Coast Craft Beer Fest coming up March 24 in Atascadero. Another brewing couple had already registered the name "Three Stacks and a Rock" before bailing after six months. The Nettnins bought the name and suddenly Chuck's brewing hobby became a real-life career. "My second batch was a chile beer, which everyone is yelling at me to bring back," Chuck said. "We're doing spinoffs on a lot of staples, IPAs, pales, a lager." The taproom also offers up food, wine, and cider. That's quite a lot to offer for such a teeny space. "We're a nano brewery," Chuck said. "We're lucky if we get two barrels at a time." Visit the brewery at 3118 Main St., suite D, or threestacksandarockbrewing.com. Not all new brewers are flocking in from out of the area. Nolan Mott of Earth and Fire Brewing grew up in Paso Robles and attended Cal Poly before moving to the valley to work for Gallo. After moving back to Paso Robles—and with a ton of bottling and production knowledge under his belt—he and his partner, Nick Vega, opened up a little brewery on Riverside Avenue. Both have a background in home brewing and craft beer appreciation. "We did all the work ourselves and didn't want to pour hundreds of thousands of dollars into a facility," Mott said. "We are focusing on classic beers, but throwing a twist on it." A good example: a lighter, easier-to-drink porter with California ale yeast versus English; a double IPA that is more floral and citrusy than medicinal, heavy, or resinous. Drinkable? Yes. Plus, the guys are offering a weekly trivia night to wash down all these sessionable brews. When I asked Mott what he thinks unites the new wave of brewers in Paso Robles and across the county, he said it's all about camaraderie and respect. "It's not cutthroat at all, like some other areas," he said. There's also that whole "freedom" thing—the desire to take life by the horns and go your own way. As it turns out, it isn't just craft beer brewers who crave autonomy. "We notice people don't frequent one brewery over another; they prefer to move around and have a beer here or a beer there," Mott said. 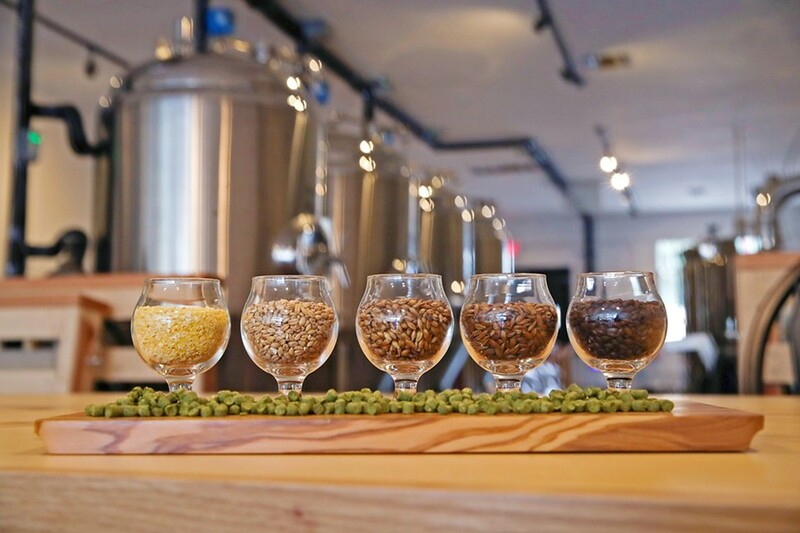 "We are all growing together and working together; we're all recommending each other's beers." Hayley Thomas Cain is polishing her boots (the beer glasses, not the shoes). She can be reached at hthomas@newtimesslo.com.